There is a common misconception about the relationship between oily skin and moisturizers. Some people say that if you have an oily complexion, you don’t need to moisturize at all. But oily skin is actually very dehydrated and failing to moisturize properly might just make things worse. Remember, just because your oily skin is actually dry doesn’t mean that you should go shopping for lotions designed for dry skin. What you actually need is a moisturizer that won’t clog your pores and can mattify, cool, and calm, while reducing shine and enhancing the balance of your skin’s natural oil levels. We’ve put together a list of the top, oil-free creams developed specifically for oily skin. These products contain ingredients that are tailored to treat your specific skin type and eliminate the problems that cause oily skin. Oily skin? Here is everything you need to know! We recommend LAVO Daily Moisturizer Cream for men and women with acne-prone skin. This cream forms a protective layer that blocks out harmful bacteria. Also, this cream calms inflammation and reduces redness very quickly. Neutrogena Oil-Free Moisture is suitable for people with combination skin. It has the ability to leave your skin soft and smooth, which is part of what makes it the best moisturizer for oily skin. It is frequently recommended by dermatologists because it is oil-free, hypoallergenic, and fragrance-free. For oily, damaged skin, we recommend Era Organics 10-in-1 Facial Moisturizer. It has a deeply hydrating formula that repairs damaged skin cells. This moisturizer does not contain alcohol, fillers, parabens, or toxins, making it is safe for children, too. For a matte finish and an oil-free formula, use Oil Control. This product is designed for oily skin. It contains salicylic acid and botanicals, which repair your skin and prevent future breakouts. If you want to control oil production and unclog skin pores, this is the best moisturizer to use. The thing that makes this the best moisturizer for oily, acne-prone skin is its natural and anti-inflammatory ingredients, which work to cleanse and repair the skin. It also moisturizes and will smooth out your skin tone over time. It is non-comedogenic and will not clog your pores. 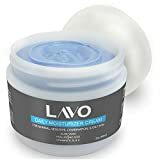 LAVO Daily Cream is a rarity among moisturizers for oily skin, forming a barely-visible protective layer that prevents the invasion of acne-causing bacteria. With botanical ingredients that trap moisture and keep skin softer all day long, this cream is said to be one of the most gentle products for treating your skin. Another interesting fact about this product is that it has never been tested on animals. As if that isn’t enough, it is also 100% paraben-free and non-greasy with no scent whatsoever. The moisturizer contains vitamins A, B, C, and D, which have two functions. First, they help to minimize skin pores, so they don’t look too open or exposed. Also, they reduce inflammation and help to renew the skin. LAVO Daily Moisturizer Cream wouldn’t be complete without the addition of aloe vera, a miracle plant that has been used for hundreds of years in skin care. Aloe vera works to heal and soothe skin over the course of just a few days. This moisturizer also contains rosemary, hops, ginseng, and sage extracts, which help to tone and refine oily skin. These ingredients also help to tighten skin pores. "My skin loves this stuff. I have oily skin and this moisturizer is working perfectly for me." "I will definitely recommend this moisturizer to a friend. It is the best for acne-prone skin." This moisturizer can improve the elasticity of skin and even out skin tone. In addition to reducing wrinkles, this moisturizer also leaves a matte finish. This product is a lotion for oily skin that absorbs quickly. Also, it hydrates the skin immediately following application. It has a slight blue tinge that can be somewhat off-putting. Unfortunately, this moisturizer can oxidize some foundations causing them to darken. Neutrogena Oil-Free Moisture is a lightweight, long-lasting moisturizer that treats oily skin and provides you with a perfect matte finish. It has been called a "love at first try" moisturizer for oily skin because it is alcohol-free, oil-free, non-greasy, and fragrance-free. You can wear this lotion under your makeup. You can also wear it on its own, as long as you don’t plan on spending too much time in the sun. Because it is non-irritating, this moisturizer can be used by people with combination skin, particularly those who have sensitive skin. Despite how lightweight it is, this cream is also hydrating enough to smooth out any dry patches of skin. 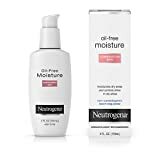 While Neutrogena Oil Free Moisture is a useful lotion for combination complexions, it usually doesn’t work that well for people with dry skin. This is because the cream is quite light and doesn’t provide enough moisture. As such, we recommend that you use this product only if you have oily skin. "This product works great for me. I combine it with Nivea for Men to create a unique foundation for my skin." "I like it because it contains SPF. It works great, but remember to keep away it away from your eyes." This is the best moisturizer for oily, sensitive, and combination skin because it is non-comedogenic. It absorbs quickly, hydrating the skin soon after application. This lotion provides enough moisture for oily skin and lasts throughout the day. This product does not clog pores. Although this is a good moisturizer for combination skin, it is too light to combat very dry skin. Neutrogena Oil Free Moisture is not a powerful moisturizer. We recommend that you try something else if you are on antibiotics. If you are looking for a skincare product that has a thicker consistency that most gel moisturizers, Era Organics 10-in-1 is a grab-and-go solution. It comes in a white plastic can, with a clean top cap and a very clear logo. This moisturizer contains dozens of natural ingredients that are designed to give your oily skin a treat. Its sweet fragrance is the result of a combination of sweet honey and fresh coconut oil. While this scent is very pleasant, it is quite subtle and doesn’t last for long. However, this moisturizer is free of dyes, mineral oils, parabens, harsh chemicals, and toxins. It is also cruelty-free and does not have any trace of fillers or alcohol. This moisturizer isn’t sticky, and that’s a good thing because it means that it is being absorbed by the skin. It is smooth and creamy, absorbing and blending well with skin. Unlike many other moisturizers out there, Era Organics 10-in-1 moisturizer treats oily skin without causing dryness. "The product works well. And the customer support is great." "This product gave me a fine look; my face is no longer oily. I’ve never looked this amazing." It isn’t too thick and does not stick to oily skin. This moisturizer is manufactured from over 90% organic ingredients, which means it is a safe way to give your skin a treat. The can is large, so this lotion should last for quite a while. That’s a good thing, isn’t it? It can also be used to get rid of dry patches on your elbows. This moisturizer treats oily, acne-prone skin in just a few days. This moisturizer is somewhat pricey. The majority of skincare products with “satisfaction guaranteed” labels are more questionable than those that promise a money-back guarantee. Oil Control Moisturizer, however, is a lotion that lives up to its promises and always has. This oil-free, mattifying formula is designed to unclog blocked pores, fight acne, control sebum production, and clear acne blemishes. It is sometimes referred to as a 2-in-1 formula because it moisturizes the skin, while at the same time removing blemishes. This power comes from the combination of salicylic acid and lactic acid. Moreover, it contains additional powerful organic ingredients, including tea tree oil, aloe vera, cinnamon, peptide, and witch hazel. This moisturizer is great for both oily skin and acne-prone skin. The manufacturers have combined cinnamon and peptide, not only to soften and smooth the skin but also to control the production of oil that otherwise leads to acne breakouts. Also, the mixture of aloe vera, acids, and tea tree oil works to balance the pH of acne-prone skin to give you a brighter, clearer, and softer complexion. This moisturizer also contains St. John’s Wort and lemon peel oil. These ingredients leave the skin shine-free, soft, and smooth by balancing and normalizing the skin’s moisture level. "I have very oily skin. I tried this product and it worked great. I will be using it more often." "It moisturizes oily skin well. The results are amazing." This is the best moisturizer for oily skin and clears acne blemishes within the shortest time. It is recommended by dermatologists and spas because it is oil-free. It acts as a moisturizer for both oily skin and acne-prone skin. The scent might be overpowering for some people. It is not for people with dry or sensitive skin. There aren’t too many beauty products that help to normalize oily skin. However, Bee Natural Oil-Free Moisturizer tops the list of the best lotions for oily acne-prone skin because it has an almost neutral pH, can control acne breakouts and normalizes oily skin. This moisturizer is lightweight and oil-free. It also contains vitamin B3, which makes Bee Natural Oil-Free Moisturizer a powerful anti-acne and anti-aging formula. This is one of the best moisturizers for oily skin because of its anti-inflammatory ingredients, sebum-controlling herbal extracts, and vitamins B3 and C. Because this product is non-comedogenic, it is safe and gentle, even for the most sensitive skin. I wasn’t sure whether this would help with my oily skin until I tried it. It does wonders on my skin. I will recommend it to my friends. This moisturizer is a recommended skincare product that works well with the HCG diet protocol. It contains feverfew extract that controls the inflammation caused by acne. You cannot use this without wearing sunscreen, and it does not include any SPF. You will need to buy sunscreen, designed for oily skin, separately. It is not suitable for people who live in extremely dry or harsh climates. Choosing the best moisturizer for your oily skin shouldn't be a struggle. You already know your skin type, and you want to give your oily skin great treatment. Note, though, that some moisturizers are designed for combination skin. With this in mind, always make sure to check the label to see if the combination includes oily skin. Generally, you want to consider the following points before you choose a moisturizer for your oily skin. In choosing a lotion for your oily skin, it is important to choose a non-comedogenic moisturizer. Non-comedogenic creams are 100% oil-free. This means they are not only safe for oily skin but good for treating oily, acne-prone skin as well. In addition to having strong, acne-fighting ingredients, non-comedogenic lotions can speed up the healing process of acne blemishes and work to prevent future breakouts. This is perhaps the most ignored criteria when searching online for the best moisturizers for oily acne prone skin. With so many more options online than in local beauty supply stores, you'll be sure to make the right choice of a moisturizer if you pay attention to reviews, such as those we have provided in this article, and get feedback based on the experience of other customers. The important thing about this approach is that it will help you to buy the right product and give you more value for your money. Many people buy the hype of skincare products that promise overnight results, but lotions like this don’t actually exist, especially when it comes to concealing acne and preventing future breakouts. In the real world, the best lotions for oily skin take some time to improve your skin. Unfortunately, there is no way to speed this up, and the majority of non-comedogenic moisturizers take up to 21 days of use before they show significant results. Be patient and allow the lotion you have chosen to do its job. If you haven’t taken care of your oily skin before, now is the time to give your skin a special treat. Overall, these moisturizers are safe for use, and won’t cause breakouts. Additionally, they are reasonably cheap and affordable. So you see, there is no reason why you shouldn’t be giving your oily skin the very best treatment. A lot of moisturizers make my oily skin even more greasy. I am for sure going to try some of these!